Negative Space Layouts - Happy campers!!! Yes, you've read right. I, the messy scrapper, am organising some of my stash - my washi tapes. I have given up on all kinds of organization tips, groups, or programs. Being tidy is simply not my style, and no matter how enthusiastic I am on the first day, things always start to get messy on the second one. However, I am having a washi tape problem. I haven't bought too many rolls of tape for the simple reason that, being such a trendy item as they are at the moment, I keep getting them with my kits. And, since I have been using them a lot, I keep them all in a clear container on my desk - the best tip I got for a messy scrapper, just keep things you use often on your desk! The problem with the tapes comes when I submit a project for publication or use it for one of my classes, and need to include a list of materials. As the tapes come with my kits, many of them came without any information of who the manufacturer is, and, the ones that had a box or bag, lost it a long time ago. I made a card today and I had to find the names of the manufacturers of five different pieces of tape: it took me way longer than making the card. I had to go the sites I get my kits from and check each one of their past kits until I found the tape I was using and wrote down the company's name. What a waste of time! So I decided I needed some kind of system for keeping track of that information. I know if I make a file with that info in my computer I will never update it again, so it won't work for me. 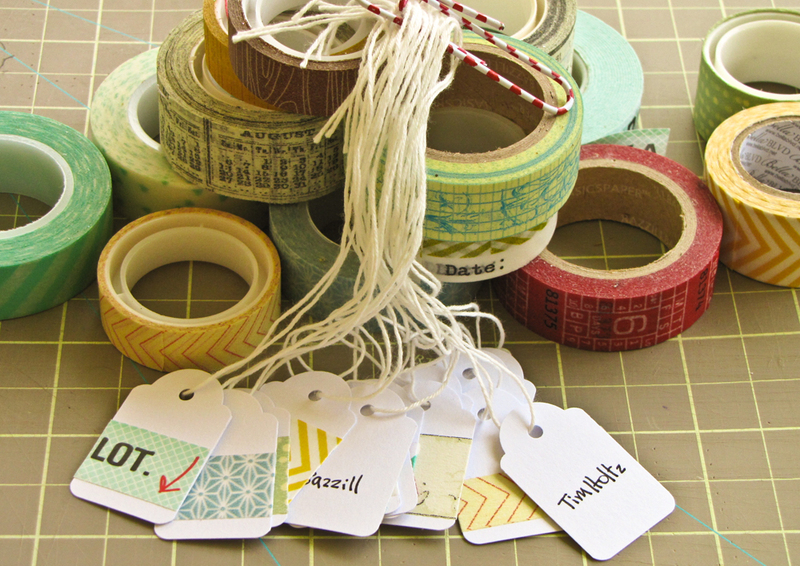 And I know that if I make a card with bits and pieces of tape and the manufacturer's name next to them, which was my original idea, I would lose among the stash on my desk and never find it when I need it. One of the only tidy things in my room is my cork board, so I realised that would be a good place for my little "catalog". I got some Blick hanging tickets that I have had since I started scarpbooking (way too many in a pack!) and put a pice of tape on each of them. Behind it, I wrote the name of the manufacturer. Simple. Easy. Something I can maintain. If any of you knows who makes this tape, please let me know! Thanks for this idea. I am forever looking for new ways to store the stash and still be able to refference. The tape in question could be a michaels brand? They usually use that type of plastic roll.